For a people to be permanently settled without the requirement of food crops was rare in North America and across the globe—a luxury, in a way. There was no imperative, either, for the Calusa to migrate from hunting ground to hunting ground stalking food, because it came to them. Big fish, little fish, shrimp, sea turtles, crabs, lobsters, manatees, and even sharks, whales, and West Indian seals—it was all easy gathering with spear, net, or quick hand." 500 years of the story of the Gulf of Mexico: natural history, politics, economics, you name it, it's all here. What it was when the Europeans found it in the 15th century (see the quote above) to what it is today (we'll get to that). And a lot of things that have been done to it along the way. This is history, not of a person or an event, but of a place. The book is written in nineteen chapters, each dealing with a different phase of the Gulf's history. It moves fast. Each chapter could be expanded into a book itself. What ties it all together is that it's all set in the same place—the Gulf of Mexico. The early Europeans found an Eden, but failed to recognize or appreciate it. They were looking for gold, and not only didn't they find gold, but they starved in the search for it while surrounded by plenty. The early chapters deal with European exploration, then gradually evolves into the jockeying for empire, with Spanish, French, English and then American efforts to control the critical points of the Gulf, such as the Mississippi River delta. There are many chapters that deal with the exploitation of natural resources: commercial fishing (the Spanish might have missed the bounty, but later businessmen didn't); sport fishing (arguably first becoming big business in the Gulf); the decimation of the bird population as bird plumes became high fashion; the discovery of oil (the very first explorers reported seeing oil slicks), then the drilling and pumping of it on a massive scale, first onshore, then on the continental shelf and ever farther offshore; lastly, the land rush, with the migration of vacationers and the rich to Gulf shores. In each of these phases, the Gulf is treated like a resource to be tamed and plundered. Its marshes are criss-crossed with canals or filled with what's dredged from rivers and estuaries to build solid land for development, its protective mangroves on its shores cut down to afford more views of the water for hotels, condos and housing estates. Its rivers and estuaries are used as dumping grounds for agricultural and lawn fertilizers and toxic chemicals from manufacturing plants that locate near Gulf shores. The impact of hurricanes on the Gulf is covered, with their making and unmaking of barrier islands, and human's never-ending efforts to save and restore and build beaches, even where they never were. The final chapters deal with the effects of climate change and sea level rise, the most serious threat of all, which no region of the US is more vulnerable to. 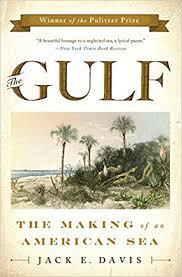 In all these chapters, Davis includes stories of individuals, whether explorers, or naturalists, or artists and poets, or businessmen, who either transformed the Gulf or sought to preserve it against unwinnable odds. I'd like to say it's an inspiring story, but after each round of exploitation, the Gulf is left the poorer. The Gulf might still be impressive today, but that's mostly because human lifespans are too short to fully appreciate what's been lost. Davis's long history ends with what I read as a wistful look to the even longer future: "The Gulf's is an ongoing story. In its longer version, humans are as the dinosaurs—only passing through, minor characters making a brief appearance, almost certainly briefer and in some ways no more important than our extinct predecessors."